Opposition Leader Bill Shorten, Prue Kelly (CEFE), Member for Eden-Monaro Dr Mike Kelly, Nick Graham-Higgs (CEFE) and Derek Povel (CEFE). Photo: Clean Energy for Eternity (CEFE). Tathra’s history in both addressing and living with climate change has seen it placed at the front of the queue for one of Bill Shorten’s $10 million Community Power Hubs. In the Bega Valley today for the announcement, the Opposition Leader named Tathra as the first Power Hub location as part of Labor’s $100 million Neighbourhood Renewables Program. 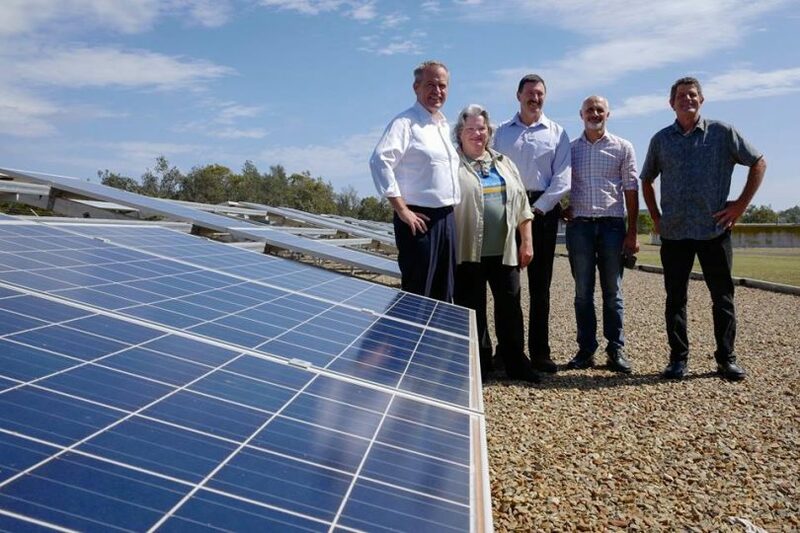 “The program is aimed at helping renters and social housing residents benefit from cheaper and cleaner renewable energy, by supporting local community renewables projects,” Mr Shorten says. Possible projects include community wind farms, energy efficiency upgrades for social housing, and grants for community groups to pilot new projects. Pointing to the Tathra community’s numerous human signs on the issue, the most recent of which read ‘Renewable Energy Now’, Mr Shorten suggested Tathra had shown leadership that was now being rewarded. “What we see in Tathra is a description of what is happening [across] Australia – the people of Australia are ahead of the Government of Australia,” he says. LIVE with Bill Shorten MP and Mike Kelly MP talking solar power at Tathra. Tathra-based orthopaedic surgeon and founder of Clean Energy for Eternity, Dr Matthew Nott says it’s terrific news for the region and well deserved. “I am sure our recent bushfires have been part of this as well, we have actually borne the brunt of climate change,” Dr Nott says. How the Hub will work will evolve over time it seems. When asked for more detail by Region Media, Mr Shorten described it as a series of projects that deliver cheaper power and renewable energy. “It’s seed funding that will generate commonsense small scale projects,” he says. “This gives us the opportunity to work together – the community, with local, state, federal government to come up with a strategic approach to powering our town with renewable energy. “This is the future, Australia should be an energy superpower,” Mr Shorten says. Clean Energy for Eternity will host a public meeting on February 19 to explore the idea of the town moving towards 100 per cent renewable energy by 2030. The meeting will be held at Tathra Public School from 6:30 pm, with former Liberal Leader, John Hewson a guest speaker.